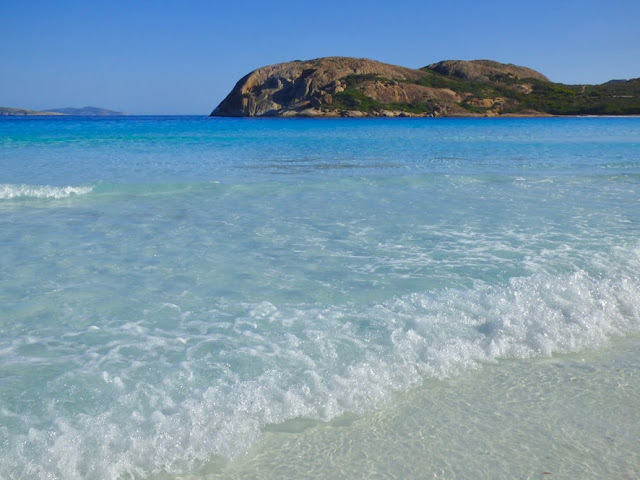 from Esperance, Western Australia. This area is as vibrant as the Nullarbor is almost monochromatic. this particular section of the beach is "fragrant" with dried seaweed. Cape Le Grand, Western Australia. After three days of dusty roads, muted colors, flies, flies, more flies and flatland, we shortcut Australia's iconic Nullarbor Plain at Balladonia Roadhouse, catching 200 km of dirt road (~125 mi) to the Shire of Esperance, and its spectacular Western Australia coastline. That shortcut saved us about 4 hours of drive time and landed us back in the land of milk and honey with green pastures, refreshing sea breezes, turquoise waters, white sands, picture-perfect waves the stuff of surfer's wet dreams, and more pragmatically, regular grocery stores, and affordable (for Australia) fuel. One more reason we stopped in Esperance - to get our tire fixed! We had a slow leak which turned out to be caused by an embedded nail. It was fixed with a plug a the local Beauparis Tire shop and seems to be holding up well now. 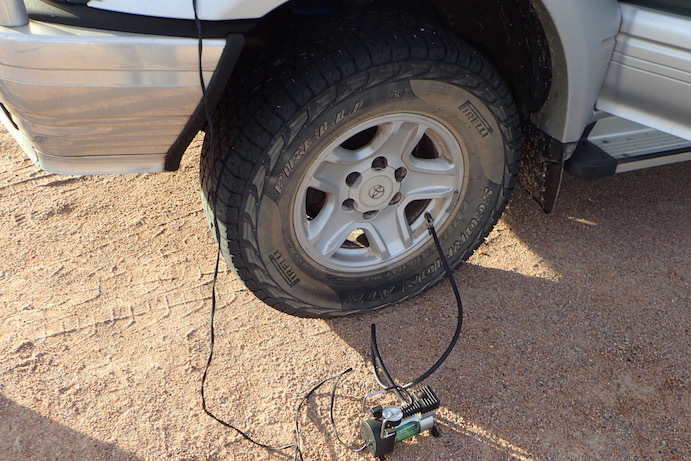 The air compressor was a loan from a fellow Lucky Bay camper. We drove a good portion of the 38 km scenic drive (~24 miles), where it was hard not to stop at every pullout (and there was probably more than 1 every kilometer) on the Great Ocean Drive (not to be confused with the better-known and far more crowded Great Ocean Road in Victoria). That day, we discovered the sea breezes were a bit too brisk at the beach level. After a light sand-basting, we stuck to a brief walk rather than lounging on the beach. It all worked out well as we arrived in in Cape Le Grand National Park with time to set up, sup and do dishes before dark. We chose Lucky Bay camp, as we heard it was both beautiful and a place where kangaroos liked to hang out on the beach. Our Land Cruiser on the beach at Lucky Bay, Cape Le Grand National Park, Western Australia. We set up and still had time to drive the beach (you are allowed to drive directly on the beach with 4-wheel-drive), walk and even check out the 'roos contentedly chewing grass while sprawled in the sand. 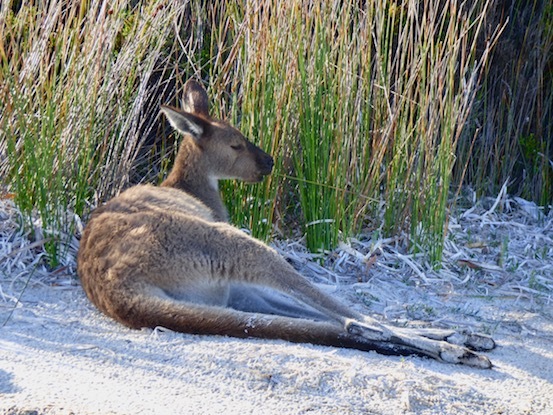 (Note: this is not our first rodeo with 'roos in the wild -- more on kangaroos in a future post). Kangaroo chomping on grass in the sand at Lucky Bay beach, Cape Le Grand National Park, Western Australia. The next morning I couldn't resist getting an early start to check our the area. By dawn, I was on the trail. 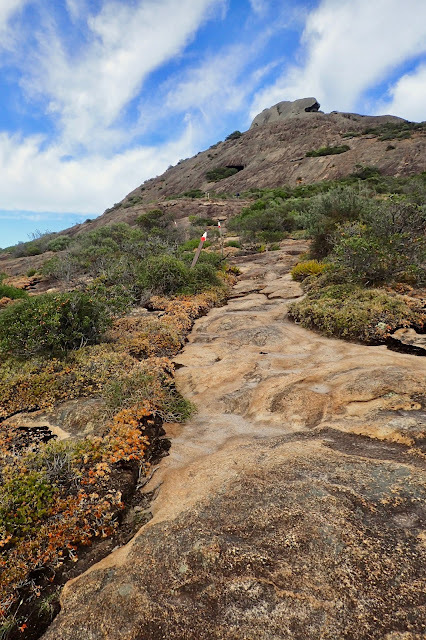 For a great summary of Cape Le Grand's Coastal Trail, click here. 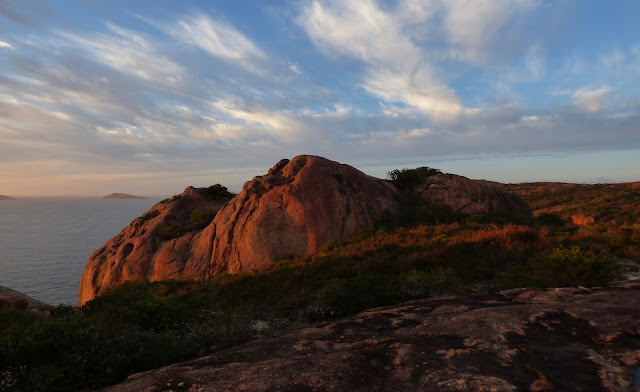 These stone sentinels above the Lucky Bay campground looked blood red in the dawn light. In daylight, they're predominantly gray. Cape Le Grand National Park, Western Australia. Sunrise on the Cape Le Grand National Park Coastal Trail. Western Australia. make a show of their own in the dawn's early light. More fabulous rock formations on Cape Le Grand's Coastal Trail, as it paralleled the coast through undulating hills. At dawn, I had the trail to myself! Western Australia. 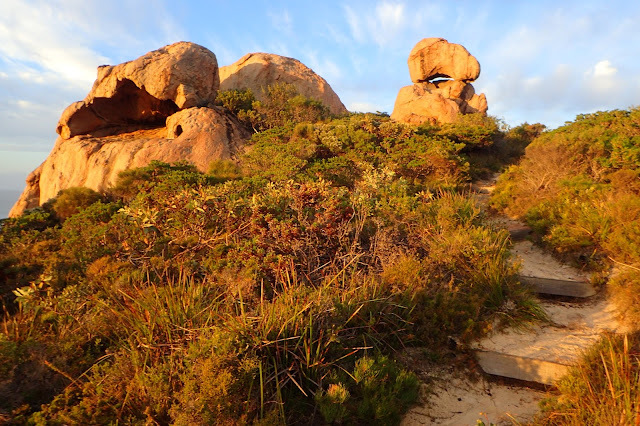 Green, blue, red, yellow, Cape Le Grand's Coastal Trail at dawn is a kaleidoscope of color. Just after sunrise we were sipping our coffee, and getting ready for another hike, this time to the top of Frenchman Peak. The climb is relatively short (~2 hours total including the return), but quite steep, a bit of nerve-wracking rock scramble. 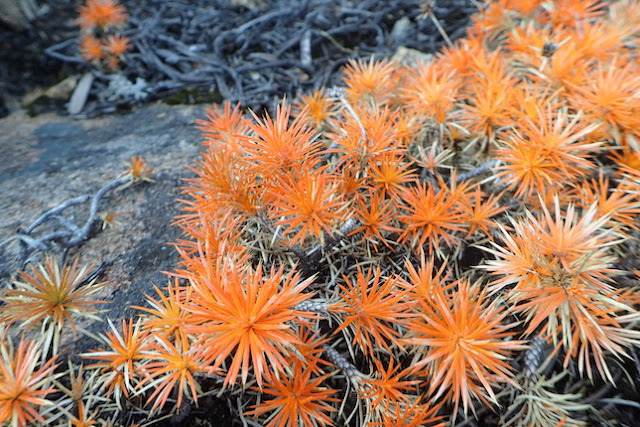 It's a beautiful hike, with gorgeous rocky formations, unusual plant life, some stunning blossoms. Of course, it offers a fabulous panoramic view from the top. and more bouldery. Cape Le Grand Park, Western Australia. The wind picked up with some ferocity just as we began making our way back down. We were glad we did the hike early, as we could understand why there were signs recommending not hiking the summit in strong winds! rock crags of Cape Le Grand's Frenchman Peak. Some other Frenchman's Peak hikers told us they preferred Thistle Cove, which they said offered every bit as beautiful a beach, and excluded the deep piles of dried seaweed on a portion of the shoreline at Lucky Bay. Ah well. 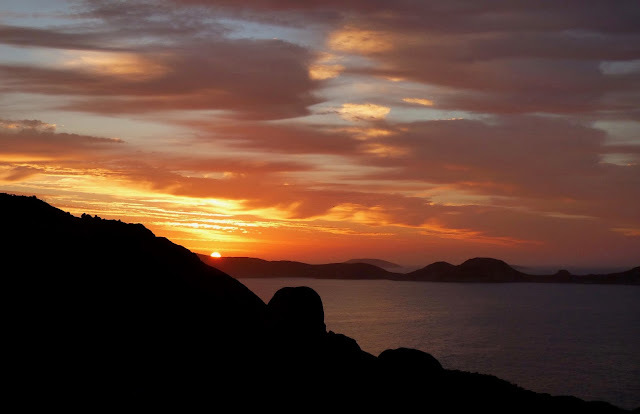 We were delighted with Lucky Bay -- especially after our dusty Nullarbor parking lot campsites (there is no camping at Thistle Cove), and can add Thistle Cove to our if-we-return-here wish list, along with Hellfire Bay (also not a camping site, day-use only). On the way out of Cape Le Grand National Park there was yet another treat in store. 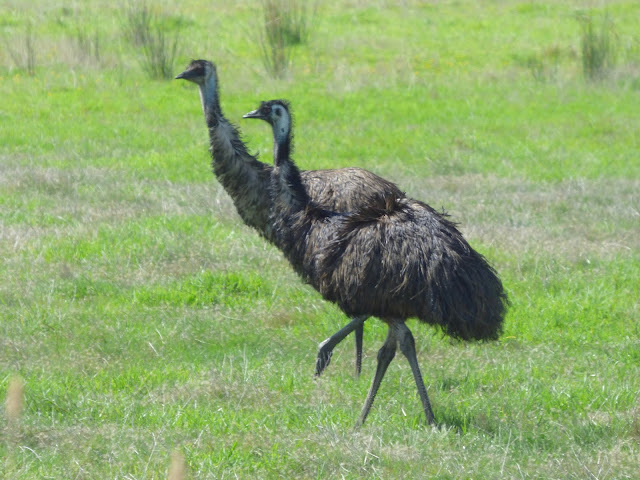 Flocks of emus wandering loose in the green, green grass. It's hard to not be fascinated with the giant, gangly non-flying kissing cousins to the ostrich. 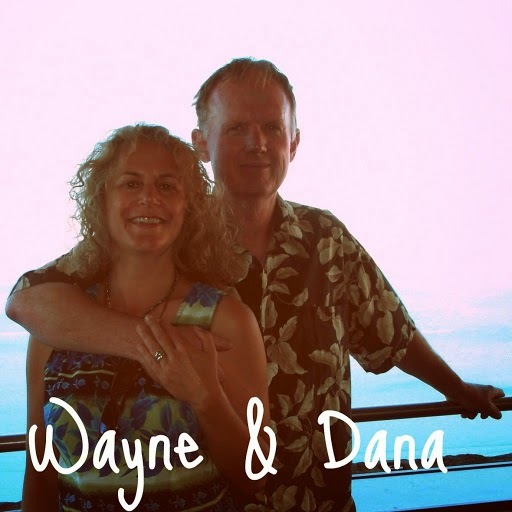 We're grateful they survived "The emu wars." Two emus from the flock walking in tandem in the green, green fields of Esperance, Western Australia. Blue skies. Clean air. Clear water. Great hiking. Far fewer tourists than in our earlier travels. We could hardly wait to explore more of the Western Australian coast. Good thing -there's a lot of it! Cape Le Grand National Park offers a glorious green and blue contrast to the almost monochromatic Nullarbor pallet. Location Location We crossed the Nullarbor, from March 11-13, 2017. 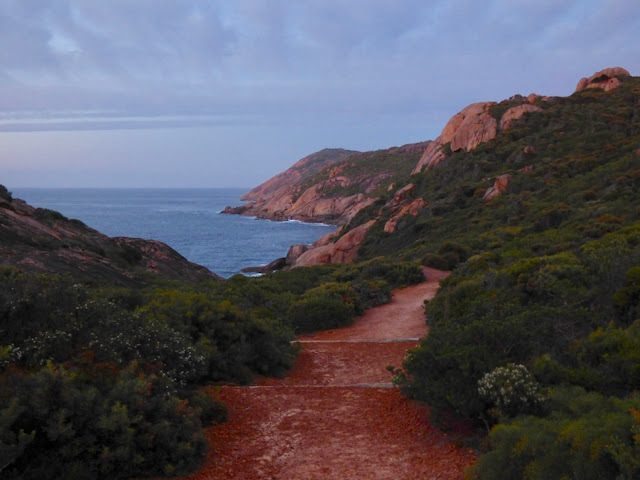 After much ooh-ing and ahhh-ing over the Esperance Coastline, we made it to Cape Le Grand National Park, where we overnighted and spent the next morning before moving on. We are currently in Broome and have yet to figure out our next stop as we continue our clockwise tour of Australia.